You’ve heard the saying, “Everybody has a story to tell?” Well, here’s your chance to discover how to get your story down on the written page! In the new audiobook, “Unleash the Book Within,” you’ll discover everything you need to know to quickly and easily achieve your dream of becoming a respected author! How to choose a proven subject for your book that will guarantee people will want to buy it – people never change. Nor do their basic desires. They’ve existed for thousands of years and will continue to exist for thousands more. Thats good for you – as an author. Discover here what people want and how to profit wildly from their desires! How to choose a topic for your book that will make writing seem like anything but work – follow these tips and you’ll soon be looking forward to writing everyday … even if you’ve always hated it in the past! How to brainstorm the most profitable title for your book – these tips could literally be the difference in you producing a best-seller or a bust! How to create a powerful outline for your book - even if you hated English class and never paid attention when the teacher discussed this boring subject! The most productive way to find great content for your book – you may be very surprised at what you read here! The simple way to get experts on your subject to contribute content for your book – these tips will save you time and effort and put you that much closer to having your own profitable book! The secret that allowed me, the author of this audio book, to make $10,000 in just in less than 45 days – and how you can use the same technique to create a book and explode your own income in no time! 1. How easy it is to write your own highly-profitable book! 2. A step-by-step process that you can follow over and over again to create more profitable books! If you want to be an author – or a best-selling author – the truth of the matter is whether you think you can or you think you can’t – you’re right. You see, your perception of your ability is your ‘reality’. So while reading the rest of this letter, I want one very simple thing from you. Just one. I want you to forget everything you’ve learned or heard or feel or think is the truth. Not forever, just while you read this letter. I want you to read this with an open mind and a blank slate. Listen, I’ve known people in your spot. I’ve watched them let fear and doubt destroy their dreams and ruin their lives. And I’ve also watched the ‘light bulb moment’ happen when it just all came together and made sense for them. I’ve written the “Unleash the Book Within” audio book to be your light bulb moment. Trust me, right now I want more for you than you even want for yourself. I can see – plain as day – you as a best-selling author. People coming to you for your advice based on reading your book. I see you achieving your dream of becoming an author and changing your life. But even if you can’t – I urge you to continue reading this letter. If you do, then I’m 100% sure you will ‘Get it!’. I look forward to seeing your name in print! Listening to My Amazing Audio Book! Where in your book to add your own personal content for the biggest benefit – discover here the benefit of the sandwich principle and how to use it for maximum effect! What you can easily add to your book to make it far more valuable to the reader – and much more profitable for you! How to package your book as a PDF for FREE so it can be sold online as a digital product – this information could double or even triple your profits! How to package your book as a physical book so it can be sold in online and offline bookstores – you’ll be amazed at how quick and easy the process really is when you follow these simple steps! How to get an ISBN for your book – in less than 24 hours and while saving $200 in the process! The easiest way to take orders for your book – and, best of all, this method wont cost you a dime! Are You Ready to Leave A Legacy? When you take your last breath on this earth and you pass on to the after life and you have to stand before your God – are you going to be proud of your life or in tears because you realize you wasted it? I told you I wasn’t going to pull any punches. This is serious. Your life is serious. You’ve been blessed with God-given talents and skills to improve the quality of your lifestyle by improving the quality of others’ lives. It’s such a shame to know that 95% never get the financial freedom necessary to truly pursue their passionate purpose. Don’t be one of the 95%. Follow the simple steps in my “Unleash the Book Within” audio book to move yourself into that top 5% who really live – not just survive – this life. Let me ask you a quick question: Have you ever walked along the beach … just down next to where the water rolls up onto the shore? As your foot lifts from the sand, you can – for just a moment – see your footprint embedded in the earth. But then, within a blink of an eye, the sand fills in upon itself and your footprint is gone. The beach’s surface is smooth again as if you had not left your footprint there just seconds before. Do you want that to be an example of your life? I don’t. I want to create something – a legacy – that lives on long after I leave this earth. Dale Carnegie said, “I want to spend half my life amassing as much money as I can and the other half giving it all away.” And he did. He understood the concept that the purpose of money is merely to trade it for the things you want and the things you want to do with your life. You will never be able to truly live, truly able to enjoy life, truly able to make a difference until you achieve financial independence. Are you ready to pursue financial independence and leave your legacy – or are you willing to just leave? Previous Writing or Publishing Experience! “Unleash the Book Within” is jam-packed with the tips, tricks, techniques and secrets that will allow you to quickly and easily create your masterpiece and begin earning profits beyond your wildest dreams. What to collect from a visitor to your book’s website thats more valuable than money – if you read nothing else, you absolutely must read this incredibly important – and profitable – information! How to create an auto-responder email series – that will send sales of your book soaring! How to become a best-selling author online and offline - and which one is more profitable! How to make your book a best seller step by easy step – follow this important information and you’ll soon be earning more money from sales of your book than you ever dreamed possible! How to list your book at https://www.tradebit.com and https://www.tradebit.com (Barnes and Noble) – there are two ways to do it, find out which way is best for you to use here! How to effectively elevate yourself to expert status – discover here how to use your book to make you an expert with celebrity status and position yourself for long-term success! When it Comes to Learning How to Write a Book You Need the Step-by-Step Details Spelled Out Quickly ... by an Expert Who Can Teach You the Ropes! Writing books is a great way to earn a tremendous income and all you need to succeed as an author today is good advice from a fellow writer who knows what he is talking about – like me! To go inside the mind of an expert author and learn all his secrets! To learn the writing and marketing tips and tricks that normally take years of trial and error to discover! 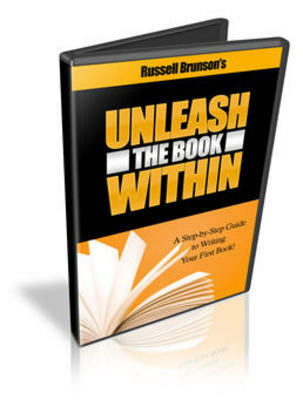 In “Unleash the Book Within,” I hold nothing back … you’ll learn how to choose an irresistible subject for your book … you’ll learn how to get expert content for your book that will save you hours of hard work and lots of money … and you’ll get all the information you need to market your book and turn it into a best-seller in no time! Choose a subject for your book that will intrigue your prospects and entice them to buy! Create a great title for your book that will drive sales through the roof! Start marketing, selling and making money with your book both online and offline! Order “Unleash the Book Within” Today & Save Money With My Special Promotional Offer! How much would you expect to pay for advice and information that quite literally could change your life and allow you to achieve your dream of becoming a successful, published author and to begin living the lifestyle of your dreams? Certainly, even a hundred dollars would not be unreasonable – but relax you won’t have to pay near that much for the “Unleash the Book Within” audio book. In fact, right now, for a limited time, you can take advantage of my special promotional offer and receive the “Unleash the Book Within” audio book for just $?? – that’s a full 50% off the regular price of $??! to Write a Profitable Book from One Convenient, Inexpensive Audio book! Unleash The Book Within profitablebook;writeabook 90167638 12.00 sinjatin Fresh Download Available!